If you follow fresh water angling around the globe, you’ll probably know that carp are arguably the most targeted species throughout Europe and Asia. Originally raised as a food source, these fish have been bred to grow bigger and faster over the years and are now the sport fish of choice for the vast majority of anglers. Their popularity drives a thriving tackle and bait business that rivals bass angling here in the U.S, as a multi-million-dollar industry in itself. At the turn of the 19th century, it was introduced as a food source in New York, but it has quickly spread throughout the entirety of the United States over the years. Although in the eyes of many bass anglers, they are an invasive species, it’s fair to say at this point that rather, they exist happily alongside the other native species here, as well as species that were introduced just like the carp itself. 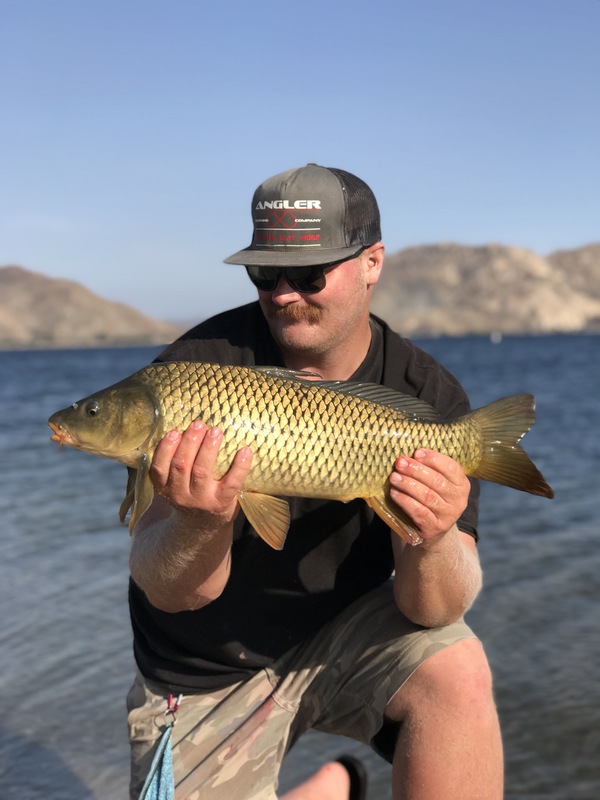 Having been born in Ukraine, I grew up hearing about the joys of carp fishing from my grandpa, my dad and their friends who still practice their traditional methods here on the lakes of southern California. However, I wanted to hear more about the modern techniques, directly from the anglers pursuing these monster carp under the radar locally. 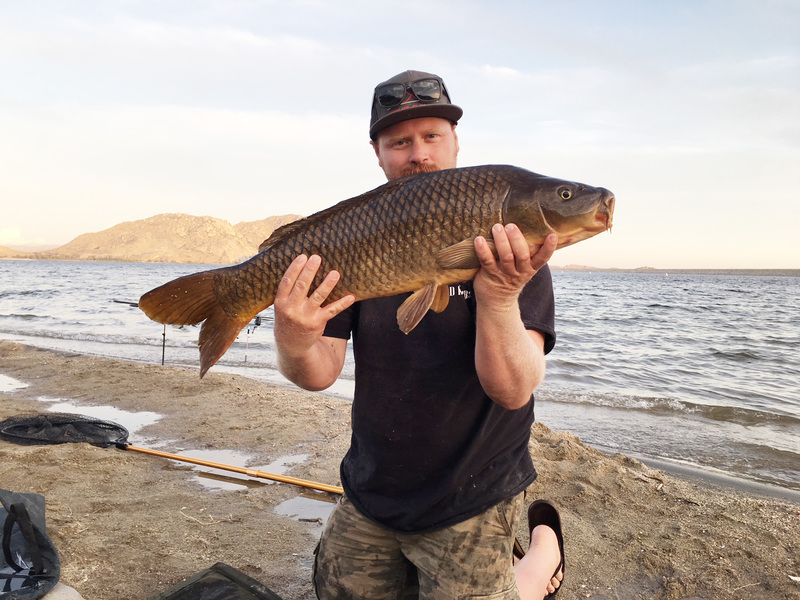 I recently linked up with David Smith, an avid carp angler from the UK, who is now living in Riverside county and his buddy Patrick, a life long Californian fisherman who’s recently fallen in love with these new angling techniques and thrill of carp fishing. Interestingly, David is an owner of a bait company by the name of CarpPro, that supplies this growing group of enthusiasts with some of the products necessary to catch one of these monsters. I’ll touch more on that later! The guys had decided on one of the many local waters that are known to contain a healthy population of carp for our session. Immediately, I’m struck by the tackle these guys are using. Long 12ft rods and large surf casting reels are standard issue to propel large dough balls the many yards necessary to reach the fish. “Being bank anglers, you a need a rod that has the ability to cast a heavy bait ball to the fish, which sometimes means over a distance of 100+ yards,” explained David. “Carp often tell you where they are by jumping and rolling, something that should never be ignored. Nothings more infuriating than seeing a fish and not being able to get to him!” he said. I watched him cast a float and sinker combo that allowed him to determine the depth and nature of the bottom, at a spot where leaping fish had been seen. “We’re attempting to understand what’s down at the bottom so we know how to present a bait and use the line clip on the reel to cast to the same spot every time by carefully determining the range” added David. 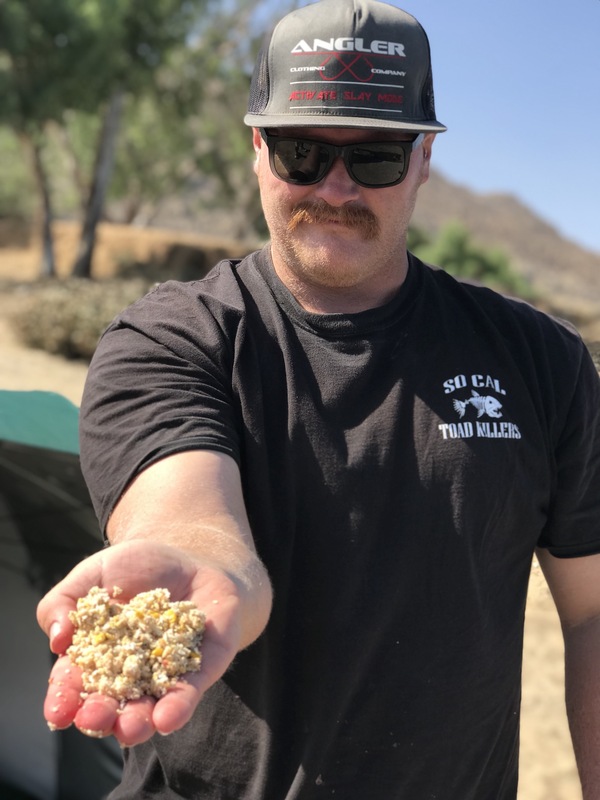 Developing a “spot” is key to successful carp angling the guys told me, especially here in California where chumming to create a feeding zone isn’t allowed. Now that they have established their spot, we’ll move on to the bait and hooking arrangements. Like many traditional carp angling techniques, things are focused largely on the way carp feed by sucking up and blowing around as they vacuum up food from the lake or river bed. We’re all fishing now, so I sit down with Pat to find out why he’s grown to love carp fishing. “I’ve fished SoCal all my life and grew up fishing these lakes and park ponds. Recently however, my trout and catfish fishing have become evermore restricted because of the drastically reduced stocking programs, particularly on the public lakes. When they do get stocked, it’s an absolute mad house, the true definition of combat fishing these days!” he mused. ”I’m looking for a challenge and something entirely new. I’ve caught carp using my traditional methods but this offers me something different. It’s deliberate and made me realize I could target carp specifically. It’s opened up a whole new “scene” for me and I’m learning something new everyday. In addition to that, these amazing fish are probably the hardest fighting fish in our local waters, right up there with striper. And just like that, you have a whole new sport. It’s reinvigorated my fishing!” David added that what we have is an incredible angling resource for our fisherman, “one that is properly managed”, so that we don’t suffer from over fishing. If it continues this way, this could be the best thing we have in southern California. For those who like to eat carp, if they take a few smaller ones and release the big girls we’ll have an incredible fishery for everyone!” “I’ve hosted several top European carp angling writers and pro anglers and they can’t believe what we have here,” he’d added. I’m starting to think these guys are on to something! Then David mentions something that really peaks my interest! “You need to realize that these techniques don’t just take carp fishing up a notch, we catch some of the biggest catfish you’ve ever seen using these methods. Anglers in our group have probably smashed the channel catfish record on just about every lake in SoCal while carp fishing!” He showed me some photos of a 30lb plus channel catfish caught not 50 yards from where we were sitting! “BEEEEEEEEEEEEEEEP!!! Pats bite alarm begins to scream and shatters the silence. We’re into a fish. It strips line at 60 yards range. The alarm has caused a stir and shouts of encouragement start coming from all directions “The tug is the drug!” calls one guy fishing for bluegill from the dock. In this article, you’ll find a photo of Pat standing behind his rod holder. He’s using what’s known as a “rod pod”. This adjustable, go anywhere rod stand is the hallmark of modern carp angling. Able to provide sturdy support for the long rods and heavy reels, it comes equipped with electronic bite alarms that signal the running fish and bite indicators that hang on the line to indicate more subtle activity as fish move in to the spot. Pat found his setup on Amazon at a great price. While you wait for your local tackle shop to pick up on this new trend, eBay and Amazon are a great place to find beginner and advanced setups like these. A short tussle ensues and we end up with a lively 10lb common carp in the net. After quickly photographing and releasing the fish to fight another day, Pat says, “That’s below average size for here” and he’s immediately back in his bait bucket, concocting a new recipe using David’s CarpPro scents and attractors to find the right mix for the big girls. With the forecasted heat wave settling in, fishing slows down and we settle in for the evening bite. As the “daytime fisherman” drift away, we have the back of the lake to ourselves and can confidently fish in to dark. The anticipation is profound as the fish start to show. It was quite the informative session and I see huge potential in what I’ve seen. 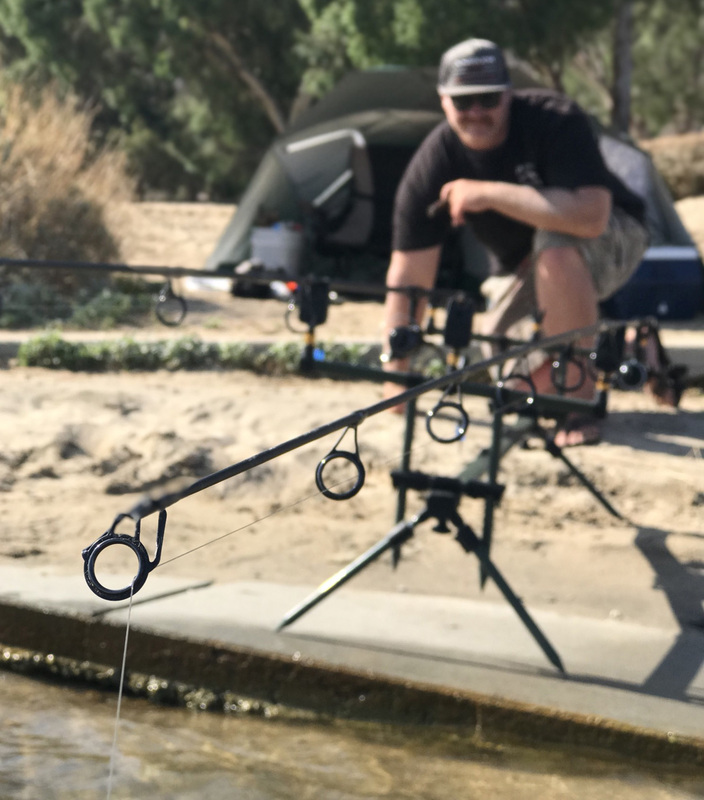 Sitting in the shade, rods fishing efficiently, safe in the knowledge that we have baited hooks, it seems to make the perfect way to fish the lakes here in southern California. It’s an enjoyable way, for groups of buddies or families to fish and enjoy a day by the water. With proper and careful management, there’s fun to be had for the catch and release trophy hunters like Dave and Pat, as well the guys looking to put some food on the table. I can imagine any kid who hooks even a small carp, considering they are truly one of the strongest fish pound for pound, will be an angler for life. These beautiful but largely badmouthed fish really are a wonderful angling opportunity for our anglers during these tough times of largely depleted fish stocks and continued draught. Viva la revolucion!